I went to Select-A-Seat on Friday, and I was happy to get Top Deck season tickets more or less where I wanted. I would like to thank David Kirkpatrick, the very nice Dodger official who helped me get two precious white tags in the coveted and sold-out Upper Top Deck. However, the Dodgers always seem to take one step forward and two steps back in making us loyal Dodger fans happy. I got this email from the organization that put a dent in my excitement for the new season. 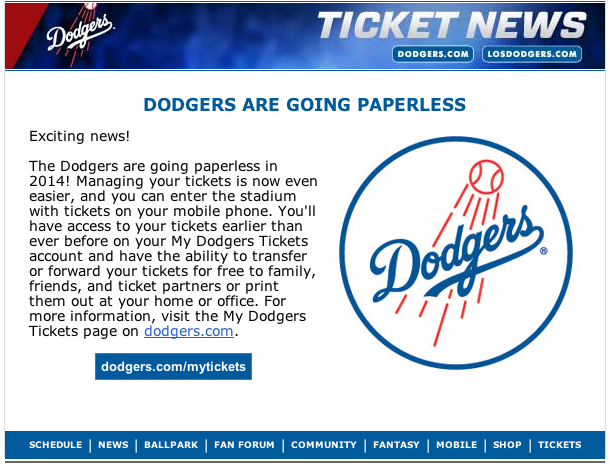 I am not thrilled to find that the Dodgers are going paperless. As my friend, Emma Amaya, has written on her excellent blog, it’s exciting to receive that packet of all the tickets for all the home games of the coming season. It’s a shame that we will miss that from now on. The digital age, so wonderful in many ways, is making life lose some of its luster. In 1990, I was in the stands for Fernando Valenzuela’s no-hitter, and I saved my stub. Years later, he autographed my ticket stub from that game, the most exciting sporting event I have ever witnessed firsthand. If that happened now, would I have to have him sign my iPhone? I know, I know. We have to save the trees, blah-blah-blah. I wouldn’t mind if they made the tickets out of recycled soda cups or hot dog wrappers. That would be fine. Nothing beats a real ticket stub. Peyton Manning is still the man.